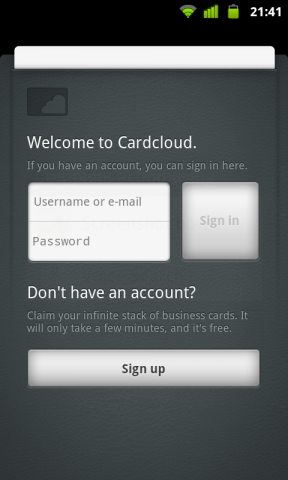 Cardcloud is an online business card service with apps attached to it. With a Cardcloud account cards will be synced across apps and can be accessed via the web too. The main principle is to create a card with your contact data and share this card with other Cardcloud users either through their nice & clean website/web app or with one of the beautiful multi-platform apps. Specifically, Cardcloud for Android was created by Engineer Jean Joskin, Engineer & Designer Gregoire Novel (@gregoiren) and Renato Valdés Olmos (@renn) as Designer. But they would like me to refer to the whole Cardcloud team since there would be no Android app without all of them. There are multiple ways to create your first card, you could also sign up on the website first and your card would be waiting for you in the app after login. 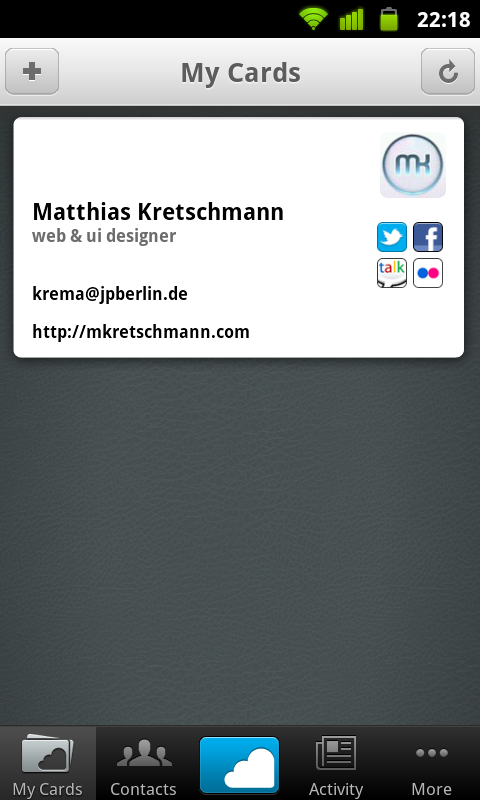 Instead I will describe the user flow of the app itself by assuming a new user who hasn’t created the first card yet. The app starts with the login screen from where you can login or create a new Cardcloud account. The screen also introduces the overall visual card style being used throughout the whole app. This is not only pretty but essential for an app which is based on a real world metaphor. When tapping on Sign up in the app you’re presented with the card creation screen. As you can see you don’t have to fill in your contact data manually but can just import your existing address book entry. That’s a welcome addition for minimizing manual text input. After filling in your contact information you pick the social profiles you want to appear on your final card. They will be represented by little icons under your photo and it’s nice Cardcloud uses a consistent icon set for all services. Now you’re done with your first card which will be presented to you on the My Cards screen. This is also the default start screen when a card already has been created. Additionally your card is now uploaded to cardcloud.com where you get a personal profile URL where your main card will be presented on the web. 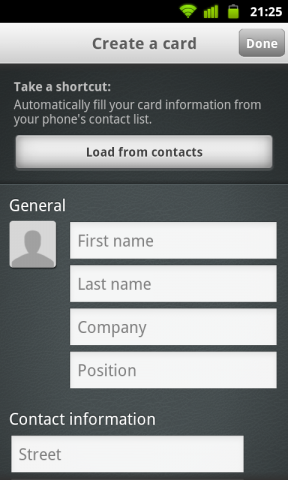 All cards you collect from other Cardcloud users can be accessed under the Contacts tab. 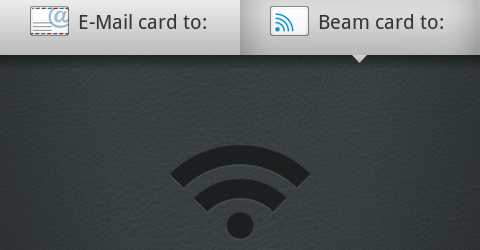 The big blue tab in the middle of the tab bar let’s you share your card via E-Mail or “Beam” it to nearby Android or iOS users. This will add your card to other Cardcloud users Contacts. And here’s the interesting thing: there’s not only WiFi involved as you would think from the icon but a combination of 2G, 3G, GPS, Wifi & triangulation is used to determine nearby users and get them connected. And they’re working to include NFC & Bluetooth into this as well. This is impressive from a technological view and from a user experience view it’s impressive how good all this technical stuff isn’t visible to end users. 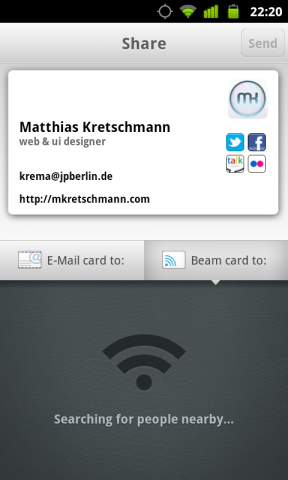 Overall Cardcloud is a very nice solution if you’re hanging on to the business card metaphor for connecting with people. By creating a whole web service around the apps, Cardcloud nicely circumvents a platform lock in where you could only share cards with users on the same platform. And for people to get your card they won’t even need a smartphone, a browser is enough. But I have one design caveat: the placement of the tab bar. 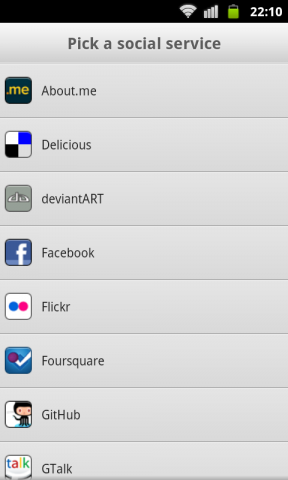 The Android app was created after the iOS app and, as in this case, those apps often use a bottom tab bar. One could argue this helps getting a consistent user experience across platform borders but consistency within a platform should be more honored than across platforms. Otherwise we end up with a mix of UI standards within a platform. While the placement of a tab bar on Android is quite controversial there is a reason Google advises developers to use tabs at the top: the fixed capacitive buttons every Android phone has under the screen. Using a tab bar right above those buttons will cause users accidentally pressing one of those Android buttons instead of a tab. So beside the platform consistency argument there’s a very practical reason for top tabs on Android. 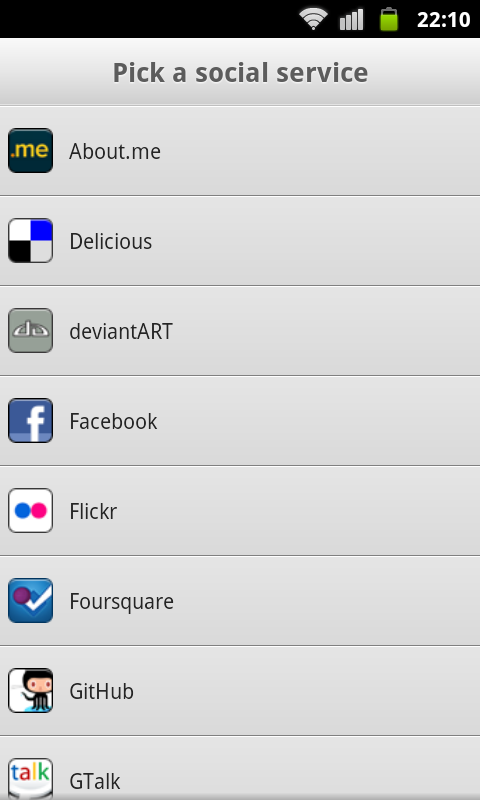 Nevertheless Cardcloud is an awesome service with nicely designed apps. Cardcloud for Android is available for free on the Android Market for devices running Android 2.1 or higher. Additionally it’s available for iOS and you can access your cards from their web app or the mobile web app too.